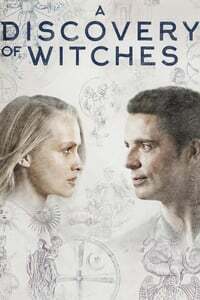 Den of Geek - Will A Discovery of Witches do more than just hit the familiar marks of supernatural fiction? Or will that be enough? Hollywood Reporter review - Deborah Harkness' best-seller about vampires, witches and academic research into the field of alchemy comes to Sundance Now and Shudder with its interspecies swooning intact. My partner and I watched this (it came out last year in the UK), while we weren't blown away we were entertained enough to watch the whole show. My partner is just finishing up the first book, which she recommends, but says that the book is quite different from show. I would have enjoyed more "romance in the stacks" with a heavy focus on ancient alchemical books & book restoration (maybe a less book nerdy & more romantic Club Dumas?) rather than handsome vampires but perhaps I'm not the target audience. Decent performances from the familiar British character actors. It's a series that improves as Diana and Edward reach a more equal footing. I do love it, in a sort of secret guilty pleasure way. I watched this first episode out of general genre curiosity (not having read the book), but, none of the characters made much of an impression on me. I may give it another episode to see if it does grow on me, but, I probably won't be posting more threads. I watched the first episode when it was on here last year, but didn't bother with any more. It wasn't especially gripping, to say the least, with nothing in particular I'd not seen before, Afterwards I remembered that I had read the book, but remembered practically nothing about it, except giving it up half-way through. Ont thing though, it crops up quite often as a trope, but where does the idea come from that being a witch is something you inherit, rather than something you choose to do? I can see that it might run in families, as some jobs do, but surely being a witch is something you have to learn, rather than something genetic. As you can see, I've got most of my ideas about witches from Pratchett. Ont thing though, it crops up quite often as a trope, but where does the idea come from that being a witch is something you inherit, rather than something you choose to do? > "... the book is quite different from show." I personally think that the show being different in any way could only be an improvement over the source material. Why can't witches and vampires get along? Is it because witches in this universe are fundamentally different organisms than humans, or is it just that the obvious dangers for a human and vampire being friends make for bad bedfellows. Made by Sky - the TV service owned by Rupert Murdoch. Every Sky show I've seen (they did the Pratchett adaptations and Penny Dreadful) has always seemed a bit slow - like they were trying to pad out the material (especially the Pratchett), and a bit too... merely competent? Like when you get a catering company to do the buffet for some kind of event, and all the sandwiches and dips and things look perfectly fine, and taste perfectly fine and they're certainly clean, but you don't for one moment notice the food. Whereas with something like Dr Who (which everyone's been trying to ape since 2005, whether they admit it or not), you're never really sure what you're going to bite into next, but it can taste amazing, and you don't forget it in a hurry either way. Of course, I don't have Sky, so I've not seen the show. My impression from stumbling across the trailer was that the author had started out with a spreadsheet of supernatural demographics, and worked out that the one combination that hadn't had a hit yet was witches and vampires. That sort of systematic bloodlessness seems to have carried through to the production. I’m actually really enjoying this. It’s quiet, a bit understated. I’m loving the time in the library and the bits of scholarly life. I like it better than the books to be honest, which had a worse power dynamic between the leads in the beginning.